Based on the available information, the majority of expeditions’s members were in the socially tent. 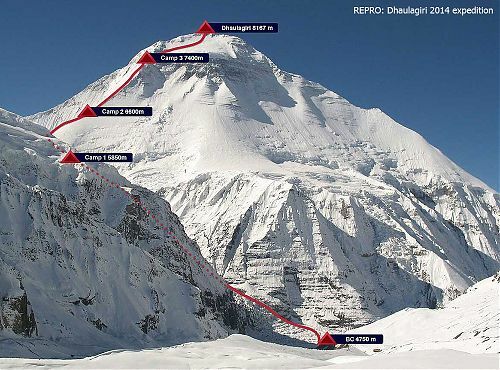 For a pity, the expedition leader climber and skialpinist Ján Matlák, climber Vladimír Švancár, and Sherpas Ghoj Kumar Rai, Dorje Sherpa and Gopal Rai were in that time in smaller expeditions’ tents. 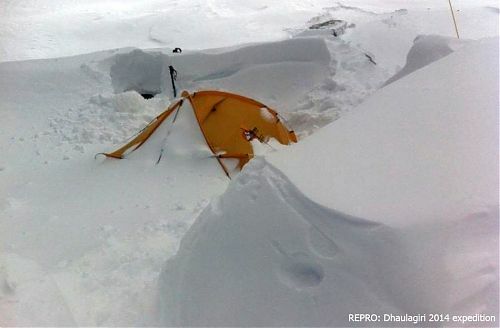 All tents were hit by avalanche. Fortunately, all people had luckily get out the social tent without any serious injuries. The group was evacuated by helicopter to Pokhara in the morning. 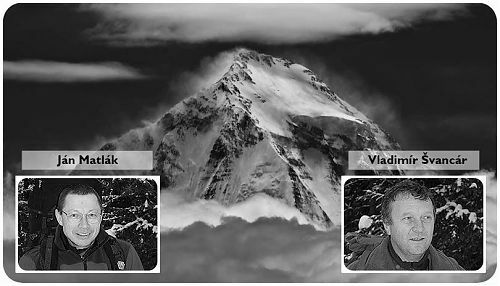 Jiří Švihálek, Peter Kostelanský and three Sherpas had flied back to BC in Oct 16, 2014, where they had found out three Sherpas and both Slovak members of the expedition. The autumn season 2014 is extremely deadly, as it is fourth avalanche tragedy within one month. Shisha Pangma – Dynafit Double 8, two avalanches in Chile. and Dhaulagiri. Currently, there are missed other tens of trekkers and Sherpas in different places in Nepal. Photo adaptation Ondra Švihálek Photo Dhaulagiri 2014 Expedition.sk and Nima Nangyal Shepra.